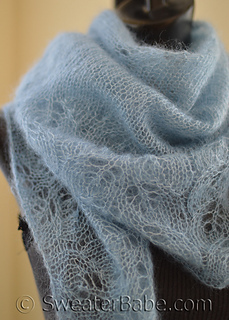 Every girl should have at least one beautiful, diaphanous scarf in her closet. 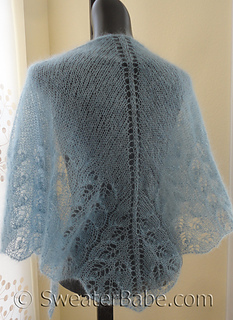 And if it’s one that she’s knit herself and can do double duty as a shawl, then all the better! Here’s one design that fits that description quite perfectly. 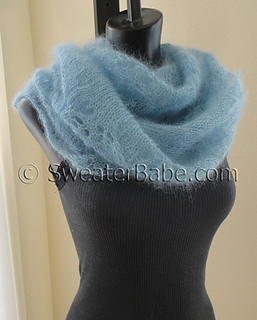 I love it best worn asymmetrically wrapped around the neck, as shown. 3 sets of eyelet increases that cause the stitches to fan out into a semi-circular shape. The two side eyelet increase sets are then shifted to the edges when the pretty leaf lace is started, creating the versatile wide, triangular shape with lacy, tapered ends. 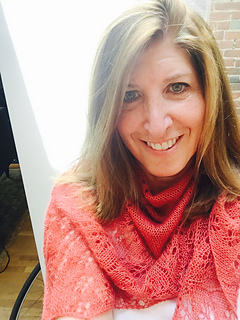 This scarf/shawl finishes easily with a gently scalloped border. 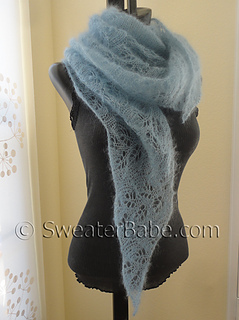 And only 2 balls of the featherweight kid silk yarn are needed to complete this. Choose a beautiful neutral color like the light grey/blue here and you’ll have a light layering piece to wear over various outfits for many seasons to come.